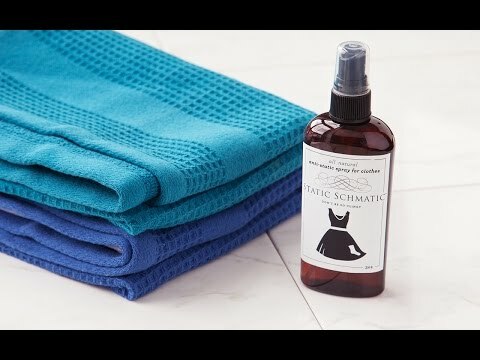 A pure, all-natural solution to easily wipe away pet hair from clothes and upholstery. No fragrance, build-up, strains, or residue left behind. Dimensions: 2" x 1" x 6"
Created in the mountains of Aspen, Colorado by mother and daughter Kris and Whitney Foley, Static Schmatic is an all-natural anti-static spray especially formulated to eliminate static from your hair, clingy fabrics, and even that fluffy pile of clean, freshly laundered clothes—all without leaving any scent or residue. Craving an odorless, non-toxic way to manage static cling, Kris spent three years experimenting with her own homemade recipes before she and Whitney turned to a Boulder-based chemist for assistance. 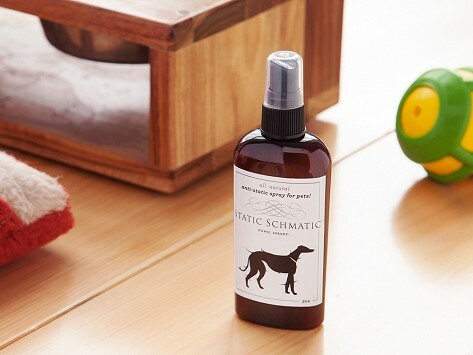 Together, they came up with a solution containing a combination of organic aloe vera juice, sea salt, and other plant-based ingredients that are tough on static, but safe for you, your pets, clothes, and the earth. Small enough to fit in a purse, glove compartment, or an office desk drawer, Static Schmatic can help you out of even the most clingy of situations. The next time static strikes, be prepared and just spritz it away.